Late last night the sad news arrived that Jack Horkheimer, known to millions as the "Star Hustler" and host of PBS's long-running Star Gazer, passed away Friday afternoon. He was 72. 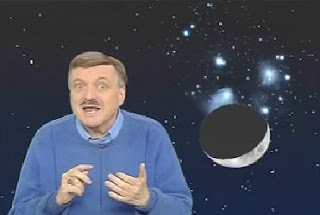 There's a whole heap o' amateur astronomers and no doubt quite a few professionals as well who can say that Jack Horkheimer, with his exuberant style and enthusiastic love of astronomy, was one of the biggest reasons why they took up naked eye stargazing. Every week since 1976 we'd see Horkheimer sitting on one of Saturn's rings (gotta love cheapo chromakey done clever) as he effervescently described the heavenly spectacles for the coming week. A very cool guy, who I am told was just as nice and energetic in real life as he was on his television shows. He will be missed.